Say bye-bye to boring grilling this summer! 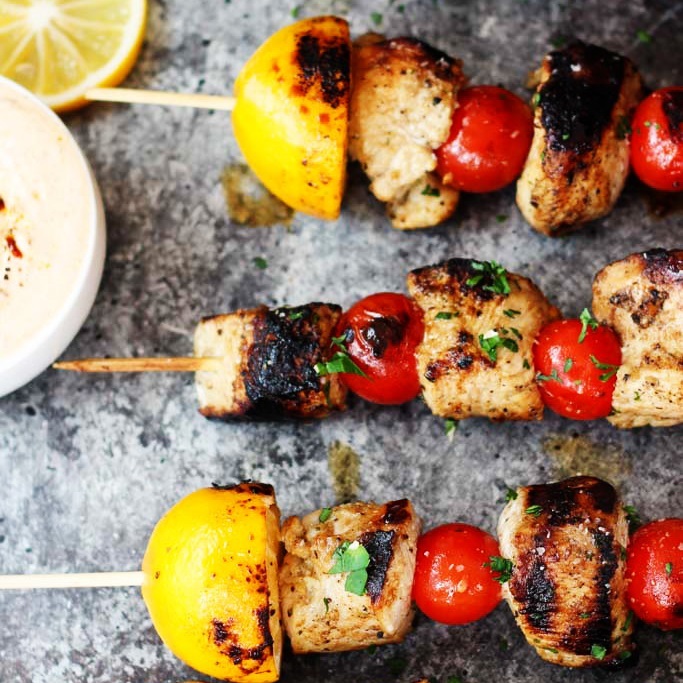 These Lemon Chicken Skewers cook up perfectly on the grill and are served with a side of Harissa Yogurt Sauce for extra flavor. The official first day of summer this year is June 20th, although, some consider Memorial Day the “unofficial” first day of summer. Either way, I say it’s time to start working on some new grilling recipes. Last year, the big hit in our house was the Umami Burger – Basted with soy sauce as it cooks, and topped with roasted poblano peppers, garlic aioli, and served on a Hawaiian roll. I mean, come on! You can’t really go wrong with a burger brimming with all those flavors. Flavor is the name of the game when grilling – In my book at least. I’m not really into boring hot dogs, overdone chicken breasts, and plain jane burgers. So, I’m throwing something new into the mix this year with these chicken skewers. Really, I could have called them Umami Chicken Skewers –because they’ve got just as much as those burgers from last year. But, why not just call it like it is? Lemon Chicken Skewers with Harissa Yogurt Sauce. The chicken is marinated in a lemon/garlic/red wine vinaigrette and skewered in alternation with lemon halves and cherry tomatoes. As they grill, the lemons intensify in flavor, and the tomatoes burst perfectly, while the chicken stays perfectly tender. But the winner of this chicken dinner? The harissa yogurt sauce. Have you tried harissa? It’s traditionally a blend of hot chili peppers (which are often smoked), garlic, olive oil, and middle eastern spices such as cumin, coriander, mint and caraway. Essentially – A flavor bomb. I recently swirled some into a bowl of hummus and was immediately addicted. Ever since then, I’m been dreaming up ways to use harissa again. Why not swirl it into a bowl of tangy yogurt and use it as a dipping sauce for these chicken skewers? They’ve already got plenty of flavor on their own, but flavor on flavor equals extra deliciousness. After they cook, I like to let the skewers cool a bit and then squeeze the grilled lemon over the chicken, with a ramekin of harissa yogurt on the side for dipping. I served our skewers alongside a simple green salad and called it good. But they would also be great served with a side of rice pilaf. Do you have a go-to summer grilling recipe that you love? 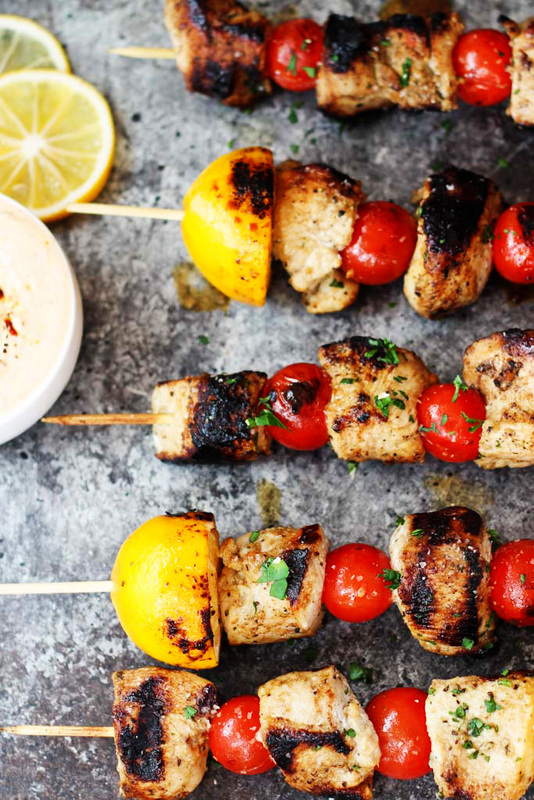 These Lemon Chicken Skewers cook up perfectly on the grill and are served with a side of Harissa Yogurt Sauce for extra flavor. Season the chicken with the salt, pepper and Sazon seasoning and place it in a baking dish. Whisk together the olive oil, vinegar, honey, cumin and garlic and pour it over the chicken. Marinate for at least 30 minutes, or overnight. 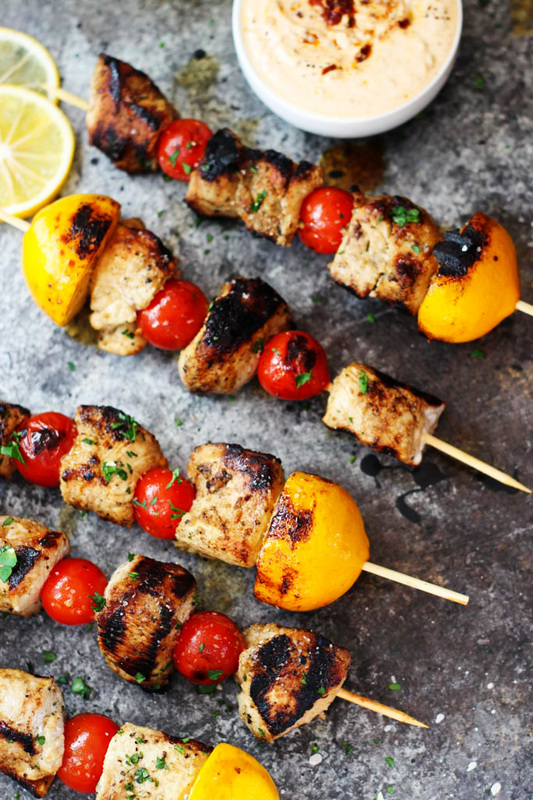 Skewer the chicken, lemon halves and tomatoes in an alternating pattern. Grill for 2-3 minutes per side, until the chicken juices run clear and the chicken and lemons are charred. Serve with harissa yogurt sauce on the side. In a small bowl combine the yogurt, harissa and lemon juice. Season to taste with salt and pepper. 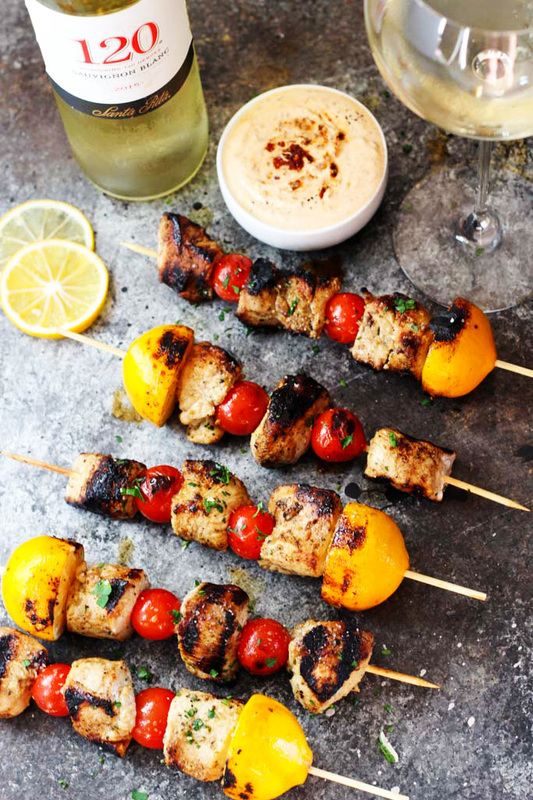 I served these skewers with a 120 Sauvignon Blanc from Santa Rita – Fresh and fruity with abundant citrus and herbal notes, it makes a great match for the tanginess of the lemon and the spices found in the harissa. A dry Rosé or Riesling would also make a great match for this dish. If you’re looking for a red wine to pair with this dish, consider something with a light body and minimal tannins – A Grenache or Beaujolais Nouveau would work well here. 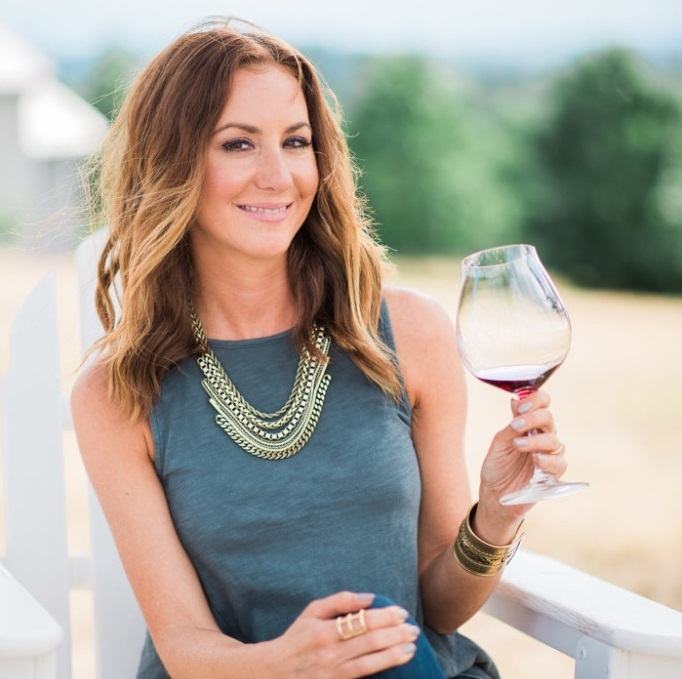 Thank you Santa Rita Wines for sponsoring this post. As always, all opinions are my own. This seems like a perfect recipe for all of the back and forth weather we have been having – comforting, yet refreshing! I love burgers at a backyard barbecue believe me but whenever I see skewers I get extra impressed! I am really into harissa right now, so that sauce sounds divine!! Thanks Erin – Isn’t it a great ingredient?! I just recently discovered it myself, and can’t get enough! That sriracha dipping sauce sounds amazing too Catherine! These look amazing! I really miss grilling! We haven’t done it in a while, we’re not supposed to because of our HOA… sad. I love skewers, so fun to eat! You should definitely get a grill pan and cook these guys inside! Bummer that you can’t use a grill outdoors!